WEST WARWICK, R.I.--(BUSINESS WIRE)--LED powerhouse Lighting Science® today announced its latest innovation with the release of its high-performance linear lighting solution, the L-Bar™. Delivering up to 4,500 lumens, the L-Bar is so powerful that one linear luminaire can replace a standard 2’ x 4’ fluorescent troffer, making it the ideal solution for new commercial construction and for legacy fluorescent lighting replacement. In fact, thanks to innovative engineering, the L-Bar is also a model of sustainable lighting design. 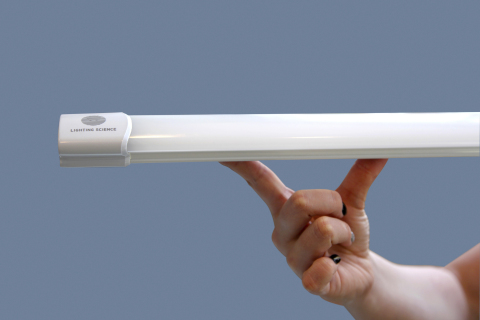 The innovative luminaire uses about 95 percent less material than a standard 2' x 4' troffer, which weighs about 25 pounds. The L-Bar’s trim profile also requires 80 percent less packaging, significantly decreasing associated product waste. Thanks to robust polymer construction, the L-Bar is a snap to install and so light-weight that it can be suspended or mounted directly to the ceiling, making it the perfect solution for difficult-to-light spaces. 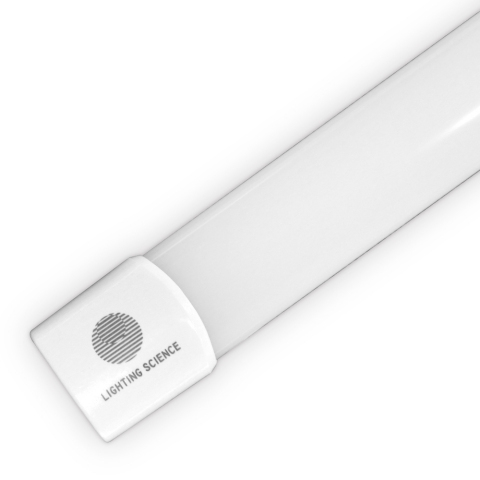 Unlike traditional LED and legacy fluorescents, the problem-solving L-Bar is also wet-rated, making it the ideal luminaire for a broad range of commercial applications, including offices, medical facilities, schools and retail, as well as outdoor areas such as parking garages and stairwells. Now available to commercial distributors and wholesalers, the revolutionary L-Bar will ship with clips that allow for direct mounting. One meter cables for suspension mounting are optional. As a truly innovative leader in the LED lighting marketplace, Lighting Science has a longstanding commitment to producing energy-efficient lighting solutions that push the limits of sustainability. The company’s environmentally-friendly LS Earth Series, which includes the shatter-resistant Durabulb™, is centered on providing high quality lighting solutions that need fewer materials to produce, require less packaging, and are energy-efficient and easier to recycle. By re-imagining how LEDs are designed, manufactured, packaged, used and ultimately disposed of, Lighting Science is creating a new category of truly sustainable lighting solutions. At their lab in Cocoa Beach, Florida, Lighting Science is experimenting with patented LEDs designed to purify water, sanitize surfaces, and even correct vision. Earlier this year, the company also launched and the next generation of its best-selling Glimpse® downlight. Lighting Science (OTCQB:LSCG) is a global leader in innovative LED lighting solutions that designs, manufactures and brings to market advanced, intelligent products for consumer and commercial applications. We are committed to using the science of light to improve the lives and health of people and our planet by inventing breakthrough, biologically-friendly LED lamps and lighting fixtures. Lighting Science is headquartered in West Warwick, RI, with research and development facilities in Cocoa Beach, Florida, and offices in China. Find out more about us and our products at www.lsgc.com and join us on Facebook, Twitter, LinkedIn and the Lighting Science Blog.